Mufida experienced some side effects during her courageous battle with cancer. She suffered from paraneoplastic neuropathy and plexopathy – a condition which affects the nerves. Due to these medical conditions, Mufida has severe weakness in both her legs which affects her walking and balance. She can only walk short distances with the use of a walking frame and for longer distances, a wheelchair is used. She was referred to Link Health and Community, so we could help improve her movement and mobility and incorporate exercise into her daily routine. We asked Mufida a few questions about her personal exercise journey and why she continues to exercise. How did you come to participate in Link HC’s chair-based exercise program? I was admitted to the Monash Medical Centre at Clayton in 2016, due to my health worsening because of my chemotherapy treatment. After staying at the inpatient rehabilitation, I was referred to Link HC for ongoing physiotherapy to improve my movement and mobility. After an assessment by the physio, I started attending Link HC’s chair-based exercise group every week, as I have soreness and weakness in both of my legs which greatly affects my walking. I find these chair-based exercises are perfect for me! Have you always been active or were you prescribed exercise as part of your treatment management? What differences did you start to notice both in your physical and mental health after attending our chair-based program? I never exercised all that much previously. However, after noticing improvements in my health by regularly attending the chair-based group, I now do my exercises at home daily – whether it’s lying in bed or sitting in a chair. Although my walking is still limited to short distances, I feel much better than before. Do you think you’ll continue to maintain an active lifestyle? Yes definitely! I really enjoy the exercises and look forward to my weekly chair-based group on a Monday afternoon. I’m able to take control of my health now with a regular, healthy routine. They are beautiful exercises, with very nice teachers. I’m very happy. “Seeing the difference that regular exercise has made to Mufida’s mobility and overall health has been really encouraging and inspiring. 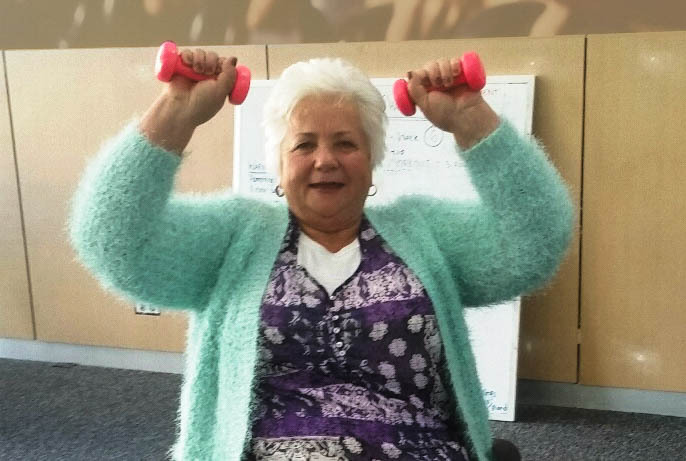 By regularly attending our chair-based program, Mufida not only exercises, but also loves to engage with fellow clients and loves sharing her story which radiates motivation within the room.” Says Michelle Thomas from Link Health and Community. If you would like to attend our chair-based exercise program or for more information, visit our website or call 1300 552 509. We really appreciate the positive feedback on our content.